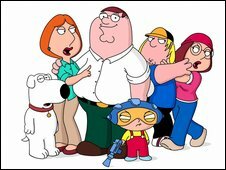 Authorities in Venezuela say they will punish TV stations if they continue to broadcast episodes of cult US animation Family Guy. Justice Minister Tareck El Aissami says the show should be banned because it promotes the use of marijuana. It is not the first time the government of President Hugo Chavez has reacted badly to a cartoon. Last year, The Simpsons was deemed unsuitable for children after officials decided it flouted regulations prohibiting "messages that go against the whole education of boys, girls and adolescents". One local station was threatened with financial sanctions for broadcasting the adventures of the dysfunctional family in an early morning slot. Televen avoided the fine by pulling the show and replacing it with Baywatch. However, they were still forced to show public service films as an apology. It also includes a talk show hosted by the country's president, Hugo Chavez. New regulations for cable TV in the country could also see cable channels forced to carry Chavez's frequent speeches.